Mornington, a town on the Mornington Peninsula facing Port Phillip Bay, is 47 km south of Melbourne. European settlement in the Mornington area comprised the Tinchingorourke pastoral run (1840) and a small fishing settlement somewhere south of Schnapper Point, which is now the site of the Mornington jetty. Evidence of both places is preserved: the pastoral run was acquired in 1846 by Alexander Balcombe, who built ‘The Briars’ homestead, and the property remained with the Balcombe family until 1976. Balcombe Creek is named after the family and the homestead is an historic property open to the public. The fishing community’s existence is marked by the name Schnapper Point, which was also a place name until changed to Mornington in 1864. 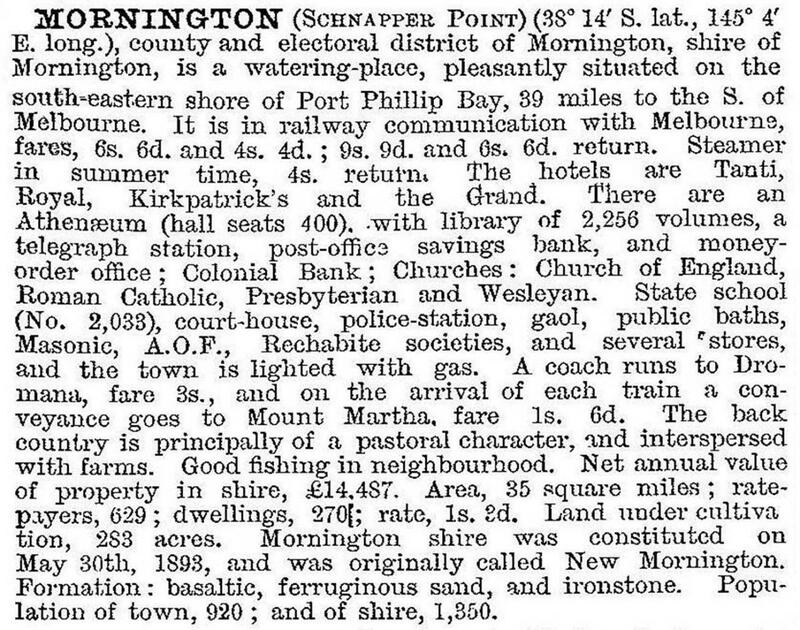 The origin of the town’s present name lies in the County of Mornington, which pre-dated the town’s survey in 1854. The county is thought to have been named after the Earl of Mornington of County Mornington, Ireland. (Cranbourne and Lyndhurst parishes were also named after British public figures). The Schnapper Point school was opened by Anglican authorities in 1856 and a Union chapel was built in 1859. St Peter’s Anglican church was opened in 1861. A road district was proclaimed in 1860, named Mount Eliza, and it was the forerunner of Mornington Shire (1871). A general store was opened in 1859 and part of it is visible in Mornington’s main street shops, at the Albert Street corner. A little way out of the village the Tanti Hotel was opened in the 1850s. During the next decade Mornington acquired its court house (1860), post and telegraph office (1864), St Andrew’s Presbyterian church (1867) and the Cricketers’ Arms Hotel (1868). The 1860s also saw the first examples of imposing holiday homes built by Melburnians, and bay steamer services brought visitors and holiday-makers. Succeeding decades saw a concentration of large residences, some further away at Mount Martha, and holiday patronage of hotels and guest houses. Surviving examples include ‘Beleura’ (1863), Kakimna Drive, ‘Southdean’ (1870s), Frontage Way and the Royal Hotel on the Esplanade. The Schnapper Point Pier was the place of embarkation until a railway line was opened from Frankston to Mornington in 1889. During the 1920s Mornington competed with Dromana and places further down the Mornington Peninsula for holiday and tourist spending. The electrification of the railway line to Frankston sped up the first part of the journey, but steam trains to Mornington or buses to either there or further away gave Mornington little or no advantage. Motor cars took holiday makers further afield, particularly to foreshore camping beyond Dromana. Mornington preserved a certain exclusiveness, and some fashionable residences were built for extended holidays. Examples are in the Esplanade. The trend continued into the 1950s with houses designed by Robin Boyd and Chancellor and Patrick, and there is a group of Modernist houses (1950s and 1960s) near the corner of the Esplanade and Beleura Hill Road. By then, however, Mount Eliza and Mount Martha were competing for architects' attention. Mornington’s qualities were described in Broadbent’s guide to the Mornington Peninsula in 1949 as having old world charm, reminding people of seaside towns in Sussex or Hampshire. It had excellent harbourage for boats and a well patronised ‘Mothers’ beach’. There were bowling and croquet greens, tennis courts and the Mornington Racecourse. Mornington Park, near Schnapper Point, was popular for picnics. During World War II the Balcombe military camp, Mount Martha, accommodated 3000 personnel, and several guest houses and the racecourse were used for similar purposes. Peacetime saw a brief remission of the population pressure, but by the end of the 1950s new housing spread eastwards. Mornington high school was opened in 1957. In 1964 the Tanti Park estate was established by the Victorian Housing Commission, and Mornington also spread southwards towards Mount Martha. By the 1990s ‘The Briars’ Historic Park on Balcombe Creek was the largest remaining barrier between Mornington and Mount Martha. The Briars Park remains, but Mornington and Mount Martha are a merged suburbia. In the early 1980s the land east of Dunns Road was open country, with a large block reserved for a future civic centre at the corner of Dunns Road and Mornington-Tyabb Road. The new centre was not built and the land is Civic Reserve. Nearly all else is houses as far east as Balcombe Creek, except for Bentons Square shopping centre (2002) and Benton Junior College (2003). Houses have similarly filled the landscape from the east side of the railway reserve to the racecourse. On the Nepean Highway, opposite the Mornington Secondary College (formerly technical school) there is the Peninsula Lifestyle shopping centre with Bunnings and Officeworks stores. Mornington has a interesting and comprehensive main street shopping area, although the building of a free-standing shopping centre a short way eastwards was agreed to by the shire council when it was administered by commissioners in the mid-1990s. The parks and open spaces are more secure from competition, bordering the foreshore either side of Schnapper Point. There are also sporting reserves, a golf course and several sports facilities adjoining the former shire offices in Mornington-Tyabb Road. Schools comprise State and Catholic primary and secondary campuses and there are two hospitals. The Mornington Yacht Club is at Schnapper Point and the Racing club holds a popular summer racing carnival.